Topic: Gil Lopez, of Smiling Hog’s Head Ranch, will launch the conversation with a crash course in growing and eating fungi, algae, bugs, and pickle-ables – on this world and the next. He’ll bring an assortment of bugs to top off our Dim Sum mushrooms. 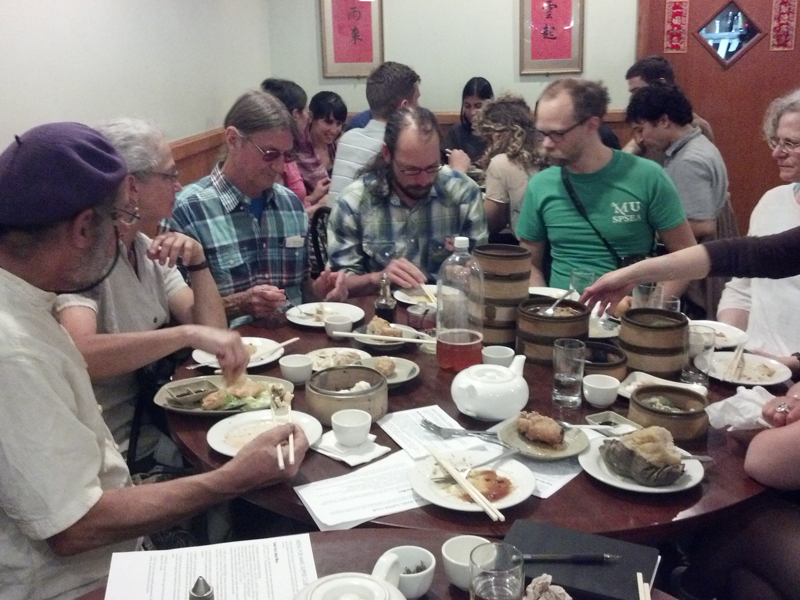 Location: Vegetarian Dim Sum House (in honor of Yinghuo-1), 24 Pell Street, in Chinatown. RSVP: Room for 30, first come first serve! Gil Lopez gave us an overview of his research into growing and eating mealworms, grasshoppers, and fungi, and brought along samples of each for us to taste. We drank his homebrew kombucha, which he produced by using a symbiotic colony of bacteria and yeast, a ‘SCOBY’—it was slightly fermented, a tad fizzy and pleasantly sour and refreshing. 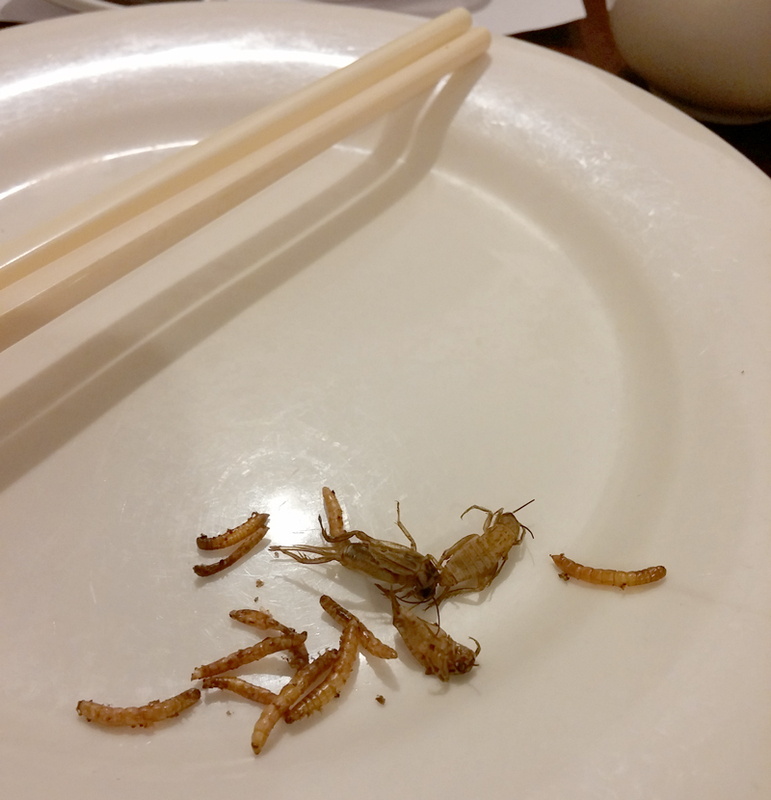 We added the grasshopper and mealworms he toasted up for us to our Chinese food meal—they made a nice crunchy/nutty addition. Gil also brought up the idea of integrating fungus-growing with the space ship and living quarters. Taking advantage of the time elapsed to get to Mars, he suggested the idea of seeding fungus mycelium into furniture items such as a chair made from a soil-like substrate which would expand and grow during the voyage and could be ‘harvested’ at the end—and in the meantime used as a chair, thus saving valuable room aboard the ship. He cited early Earth ocean explorers dropping off a few goats on uninhabited and densely vegetated islands, and returning later to the less-vegetated island full of protein-rich goats later. 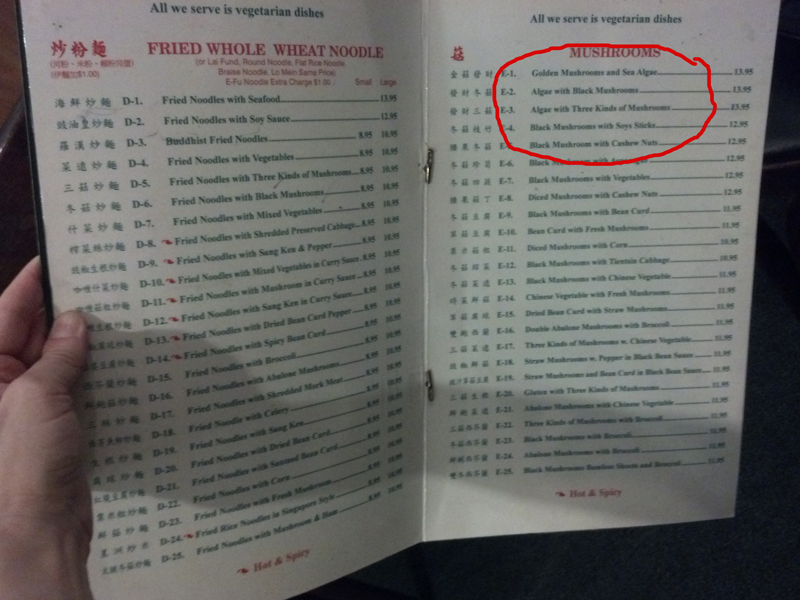 Turning to the Vegetarian Dim Sum House menu, we see that everything on the menu is vegetarian—all traditionally meat-based Chinese food items have been made with substitutes. Mock duck, mock pork, and mock beef abound—most are soy products with varying densities and textures to emulate the meat. Could such technology be adapted for Mars? Perhaps the processes creating such a wide range of characteristics could be enlisted to keep the food options varied for colonists.